If you were to describe the top prospects coming into the 2018 PBA Draft, it would have been the following. CJ Perez and Bobby Ray Parks; franchise. Robert Bolick; electric. Abu Tratter; intriguing. Trevis Jackson; mysterious. It’s a tag that’s used in almost any sort of draft, whether it be the NBA, PBA, or even in recruitment of High School prospects. There are two ways of looking at a player who is deemed as a safe prospect by analysts. One is how you can’t really go wrong with drafting or picking up this player. He can fit in your team no matter what position he plays. Mocon fit that bill. Any team, no matter how loaded that may be, would have had use for his skillset. Before the draft, he was viewed as a stretch four who had quite the knack for grabbing rebounds. He brings a modern game to the league. He has the skill to play multiple positions, but he also had that old school toughness everyone has associated the PBA with. Another way of looking at a safe prospect isn’t as rosy as the first. Being deemed “safe” can be considered as shade at one’s upside. We hear it all the time during draft season. “This player has tremendous upside!” Mocon, sadly, did not fit that bill. He was projected to have a decent career moving forward, but never did anyone view him as a franchise altering prospect. He’d be a fifth option at best, someone in the mold of a Bitoy Omolon. He’ll get his points every now and then, but never in large sums. He has value, but would never be considered for awards. Mocon was safe. He was dependable, but not elite. Reliable, not game-changing. Not much then was expected from his debut, as fans were much more interested with how Perez, Bolick, and even Bong Quinto would fare in their respective first games. There was nothing spectacular from Mocon’s first game out of college. He finished with 13 points and five boards. In fact, some would even say you’d expect him to put up those type of numbers, especially in a Rain or Shine system that has never gravitated towards just one player. It didn’t deserve much praise, but it was safe. Just what the doctor ordered. But watching the tape of his first game, as well as the following games he had, and we’re witness to the birth of a new player. A Mocon that isn’t just safe, but is so much more. While offensive rebounding and being a stretch four have been the words used to describe Mocon’s game, a better term that seems more fit to distinguish him from the rest would be: efficient mover. He doesn’t waste any of his movements whenever he has to act upon off the ball. Because of this, he’s able to conserve his energy for plays that matter, like grabbing those offensive rebounds that go unnoticed far too often. It’s what made him so effective in college. Don’t expect him to take that facet of his out of himself as he starts to build a career in the PBA. It didn’t just translate to when he’d grab offensive rebounds. One of the most underrated qualities of Mocon during college; his set shooting. Surprisingly, he emerged as one of the more reliable set shooters with the Red Lions, using the amount of attention defenses give on creator Bolick and big man Donald Tankoua to the team’s benefit. There isn’t any fuss with how he does it. He calmly waits for opportunities along the wings, knowing he isn’t the first option of whatever action the Red Lions run. He simply moves efficiently, doing the safe things to help his team. With four championship rings, you can’t doubt that formula. In the PBA, he’s taken this up a notch. He still calmly waits for opportunities when need be, but he’s added some more spice with his shooting. He’s been taking 3.29 threes per game in 22.19 minutes of play, right around his average back when he was in the NCAA. The difference is, he isn’t just taking set shots anymore. 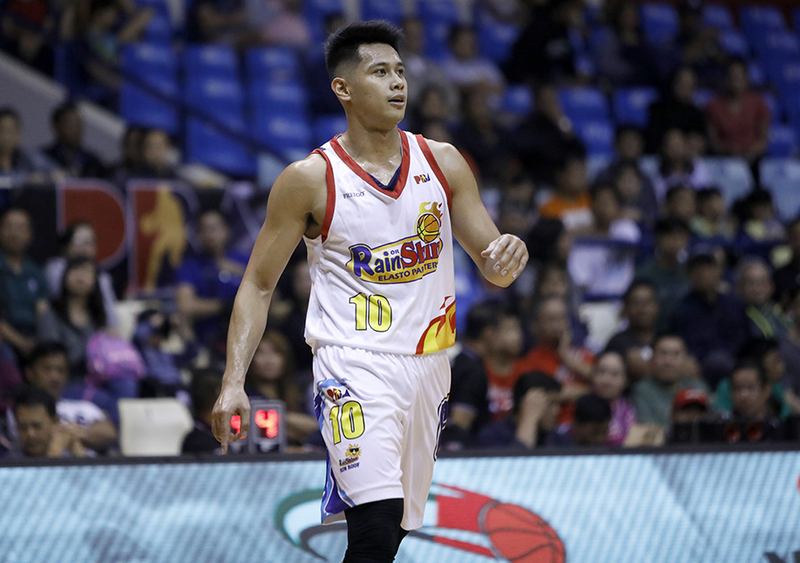 There have been spurts, especially during his breakout game versus the San Miguel Beermen, where he attempted a couple of pull up threes. The results haven’t been pretty for the most part, but the fact that he looks comfortable shooting those off the pick and roll is a good sign moving forward. Yet, despite his evolution, he’s still at his best as an efficient player off the ball. This time, he doesn’t just wait his turn and hop into threes when the opportunity presents itself. 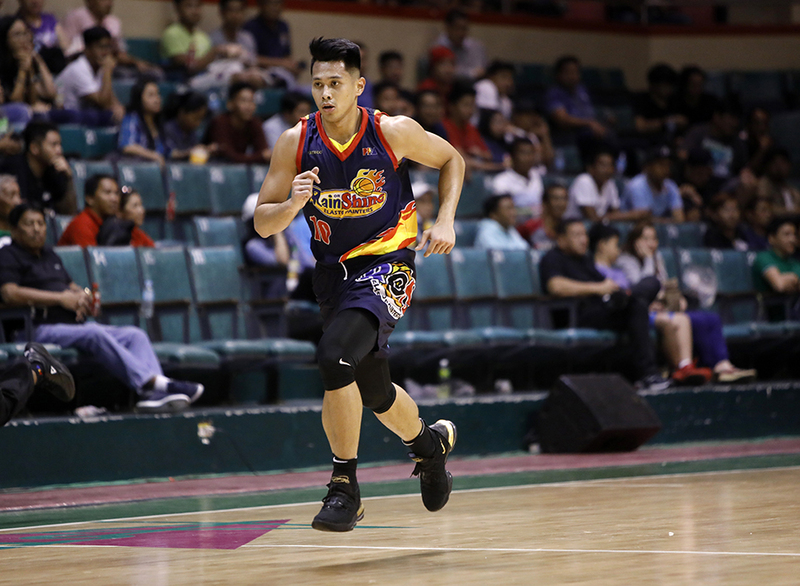 Now with the Elasto Painters, he’s started to put in more movement — from cuts, curls, flares — without sacrificing his trademark efficiency. Just putting in that movement can be difficult for even the best of shooters. Mocon’s transition from set shooter to legitimate catch and shoot option has been a delight to watch, as he’s comfortably hopped into threes with utmost comfort. The offensive rebounding is inevitable at this point. His shooting is starting to become an important staple of his game. His movement is a large part of what has made Javee Mocon who he is. Up until this point, he still remains safe. But the leap for Mocon is arriving, largely because of his increasing willingness to create off the dribble. During High School and College, he never really needed to create his own basket because he had other teammates who could do it better than he did. From Arvin Tolentino and Andrei Caracut with the Red Cubs, and Bolick with the Red Lions, Mocon has fit best as an efficient mover off the ball. Put him in the pick and roll, and he seems perfectly comfortable making decisions no matter how the action is defended. Sometimes, it can be as simple as getting the ball off the catch. From the catch, he assumes the triple threat position. Back then, you’d only expect him to shoot. Take away that option, he’d probably pass it back to his point guard. But now, he’s added the second threat from the triumvirate: dribbling. It’s only one thing. There’s still passing he still needs to work on. But that one thing is a large step in the right direction, one we didn’t even expect him to take coming out of the draft. You still can’t go wrong with Mocon. He still remains safe. With his efficiency, smarts, and power, he’s bound to have a career in the PBA as an incredibly reliable player. His floor is as high as anyone, thus his tag as a safe prospect. But Mocon clearly wants to go beyond being just safe. He’s breaking out of his mold and willing to play roles he hasn’t played before. He’s learning new skills and becoming more confident as a player. Mocon wants to break that “safe” ceiling put on him. The same one he obliterated once he graduated a champion with the Red Lions.